The best and worst Eminem record I've ever heard. Album Rating 3 out of 4. 1. Walk On Water (feat. Beyonce) - 4 out of 4 - Probably will go down as one of the most underrated of Eminem's hits. The song encompasses all of the talents and personalities of one of this generations greatest artist. Unlike some of his prior works, the song is not set on a grand stage but a simple piano-driven beat with raw, honest lyrics and a beautiful hook from Beyonce. 2. Believe - 2 out of 4 - It's interesting to hear Eminem switch it up and rap over more trap-like beats. Honestly, he does it better than most of the younger crew using trap like beats daily. Still, the vocals seem dated and a poor attempt at trying to stay current. 3. Chloraseptic (feat Phresher) - 3 out of 4 - Now unlike its predecessor this track showcased Em, on a better put together trap like beat and song overall. The bass is pulsating, hypnotizing and mixes well with Eminem lyrics. Again I have to note it's still an attempt by an aging artist trying to stay current. The hook is addictive, simple and easily gets stuck in your head, Phresher does well feature here. 4. Untouchable - 1 out of 4 - Confusing and perplexing, that's really all I got to say about this one. 5. River (feat. Ed Sheeran) - 1 out of 4 - Although I believe this is one of the album's singles, it sounds so much like "Love The Way You Lie." I can't help but feel the song and lyrics are generic and literally a cheap remake with Ed Sheeran instead of Rihanna, the radio will love it lol. 7. Remind Me - 3 out of 4 - Although I just harked on how much "River" was a cheap rip off of "Love The Way You Lie," I like "Remind Me." I admit nostalgia probably has blinded me, considering he remade Joan Jett's "I Love Rock N Roll" on this one, the lyrics are also spot on. Unfortunately, it is also a generic and literally a cheap remake of "Berzerk." 9. Like Home (feat Alicia Keys) - 4 out of 4 - Eminem at his best, doing something original and bullying the bullies, in this instance Donald Trump. The lyrics are beautiful and Alicia Keys makes this track perfect and a monster hit with a message. 10. Bad Husband (feat. X Ambassadors) - 1 out of 4 - I got to say I just didn't like this one. It was a great chance to partner Eminem with an awesome band like X Ambassadors, but somewhere along the way, this collaboration went to crap. 11. Tragic Endings (feat. Skylar Grey) - 3 out of 4 - A great collaboration with a hard-driving beat and this time Em, Isn't trying to stay current, he's just being himself. It's nice to hear him on a more Dre like beat which is what made him famous in the first place. I am not sure if Dre produced this one or not. 12. Framed - 4 out of 4 - My favorite track off the entire record. Once again nostalgia got a hold of me and hearing Eminem back using his more Slim Shady, relapse record era persona was great. He killed this track, period. 13. Nowhere Fast (feat Kehlani) - 1 out of 4 - It's funny the prior track was my favorite of the entire record, and this song, in my opinion, is the worst track on the record. Kehlani's hook is great but aside from that, there isn't much good I can say about this song. 14. Heat - 2 out of 4 - Although the entire track sounds generic and another attempt to remake "Bezerk," I got to say the lyrics and hook are slight enticing. 15. Offended - 4 out of 4 - Awesome track once again showcasing "Slim Shady" persona. The beat is hard driving and Eminem speed and lyrical precision is amazing. One of my instant favorites. 16. Need Me (feat Pink) - 4 out of 4 - A monster hit just waiting to take the stage. Although 2/3 of the song is Pink's vocal's the mix with Eminem's raps is phenomenal. You do have to wonder why the track wasn't on her record instead of his. Regardless this song is going to be on his greatest hits album, guaranteed. 17. In Your Head - 1 out of 4 - Love the Nostalgia of Em, remaking a Cranberries song, but aside from that the lyrics are poor and the track itself isn't even a good remake of the Cranberries. 18. Castle - 3 out of 4 - Great song showcasing Eminem writing to his daughter, a slight nod to "Stan." The lyrics are quite dark and seem to cover Eminem explaining to his daughter his life since she was born and his struggles at multiple relapses. The song closes with what sounds like Eminem eating some time of drug, most likely medication. 19. Arose - 3 out of 4 - A beautiful song but beat wise a dissipating ending. Cleary Eminem is rapping about his struggles with addiction, relapse and near-death experiences with overdoses. He seems to be making the attempt to make amends with his family, friends, mother, and ex-wife. 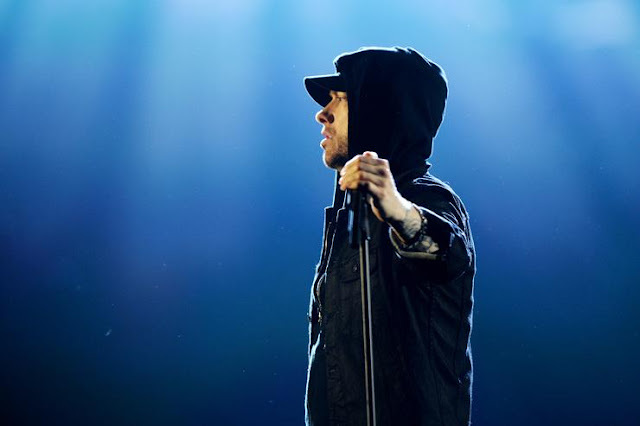 The song closes by cutting back into track 18 for a final verse with Em, stating he is quitting rap. The song and the album ends with what sounds like Eminem flushing medication down the toilet, choosing to stay clean.